The latest version of the Windows Community Toolkit, version 5.1, brings some powerful new features including making it much easier to support Project Rome, Microsoft’s cross-platform API which lets apps pass information across PCs and smartphones, launch applications and more. 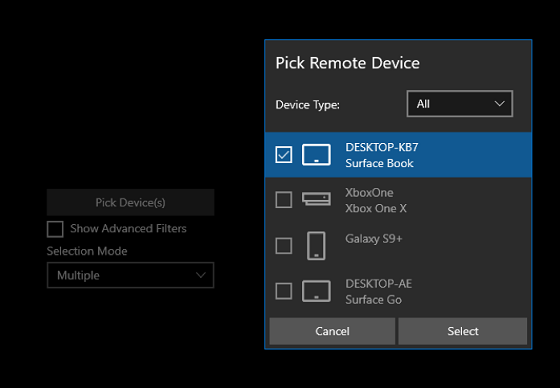 The Remote Device Picker allows a user to select a device, proximally or cloud-accessible, from a dialogue. The app can then use this information to perform various scenarios like opening and communicating with an app on the chosen device, using the power of Project Rome. For example, having your app or website (using MS Graph APIs) continue a task to another device or create companion experiences that can communicate with each other across devices, like a remote control. Read more about what’s possible after selecting a device like opening an app or creating an app service and read the documentation for RemoteDevicePicker. Read more about Project Rome capabilities here. A new Image Cropper control allows you to provide effortless image cropping functionality to your app. Perfect for user selected profile pictures and photo editing tools. See the documentation for ImageCropper here. The toolkit now supports high-quality animation support with the inclusion of Lottie-Windows. The new library provides animation support on Windows 10 (1809) by utilizing the Windows.UI.Composition APIs and allows for the consumption of Bodymovin JSON files or optimized code-generated classes for playback in your Windows apps. It is the successor to the LottieUWP community project. You can install the new Lottie Viewer app from the Microsoft Store to test out animations and generate optimized code for your Windows apps and see the documentation for Lottie-Windows here. The update also includes accessibility improvements with more fixes to keyboard navigation, high contrast, and narrator readability. Read more the new Windows Community Toolkit at Microsoft here.